Due to aff ordable technology costs, the wind and solar (defi ned together as variable renewable energy) are expected to continue. 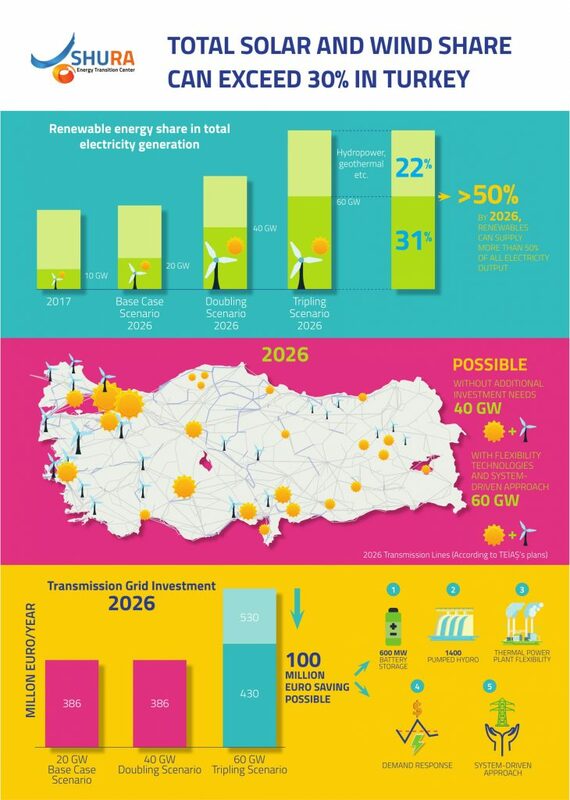 The analysis shows that Turkey can generate 20% of its total electricity from wind and solar by 2026 without negatively impacting transmission system and planning. Doubling the installed wind and solar capacity to 40 gigawatts (GW) is feasible without any additional investment in the transmission system compared to the Base Case scenario defi ned in this analysis. The total investment needed to expand the transmission grid and the additional transformer stations is estimated approximately the same as earmarked by Turkey’s transmission system operator (TSO) Türkiye Elektrik İletişim A.Ş.’s (TEİAŞ) Ten-Year Network Development Plan (TYNDP). The impact on redispatch and curtailment of electricity is found to be negligible. A wider distribution of solar and wind capacity across the country – based on demand, substation capacity and speed and irradiation – produces remarkable benefits for integration.